Maginos has come up with a plan to recruit Brodie to travel to Nextor and warn the elves of Vanestra's plans. 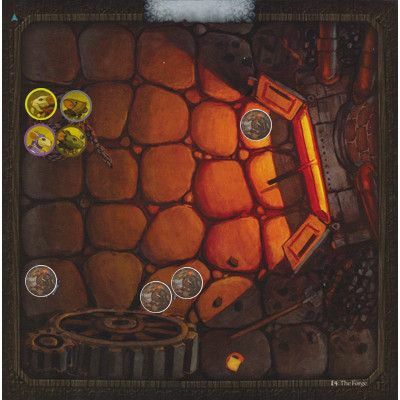 Draw Power: When attacking, Maginos receives 2 cheese for each rolled instead of 1. - Mystic Bolt - 1 - You may use this ability instead of performing a normal battle action with this mouse. Choose a minion that is on the same tile as this mouse. The chosen minion is attacked by this mouse with a ranged attack. The battle value of that attack is equal to this mouse's lore. - Invisibility - 1 - You may use this ability at the end of this mouse's turn. Until its next turn, this mouse is invisible. An invisible mouse is completely ignored by minions as if it were not on the tile at all. An invisible mouse cannot be attacked. Minions do not have to stop on a space with an invisible mouse. - Chain Lightning - 3 - You may use this ability instead of performing this mouse's normal battle action. Choose up to a number of minions equal to this mouse's current lore. Each minion figure chosen is attacked by this mouse with a ranged attack. The battle value of that attack is 3. Roll 3 action dice once to attack. Each minion defends separately. - Meeps - 1 - You may use this ability any time during Maginos' turn. 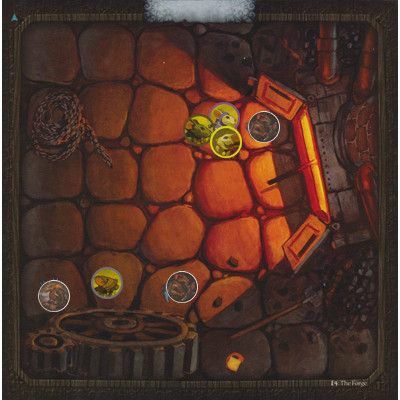 Place the Meeps marker under a minion figure on the same tile as Maginos. While on the Meeps marker, that minion rolls 1 less die when defending against an attack from any mouse. 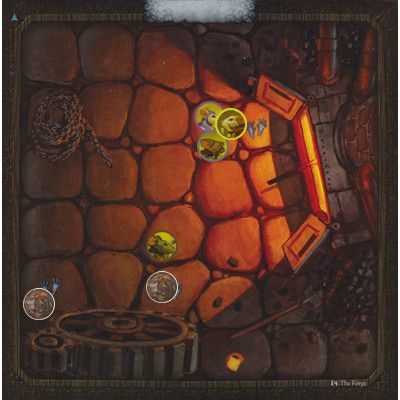 At the beginning of Maginos' next turn remove the Meeps marker from the board and place it on Maginos' card. Pilfer: After Filch defeats a minion figure, add 1 cheese to Filch's stash. If it was a rat, Filch may take this cheese from the minion wheel if available. Prehensile Tail: Filch may equip a dagger in his tail as if it were an additional paw slot. - Energy Rush - 2 - You may use this ability after taking an action with this mouse. Take an additional action with this mouse. - Find - 2 - You may use this ability after rolling a successful search roll. Instead of drawing 1 card, draw 3 cards from the search deck and pick 1. Shuffle the other 2 cards back into the deck. - Dodge - 1 - You may use this ability immediately after any figure, including this one, ends its move. Move this mouse up to 2 spaces. Fierce Resistance: Nez cannot be stunned or webbed. - First Aid - 2 - You may use this ability as a free action. Remove 1 wound marker from a mouse that is on the same spaces this mouse. Healers pay 1 less cheese to use this ability. First Aid can only be used once per turn. - Battle Squeak - 1 - You may use this ability at any time during this mouse's turn. Until the end of this turn, whenever this mouse makes a melee attack, add 1 to its battle during that attack. as 2 successes instead of 1 when defending. Draw Empathic Power: When another mouse on the same tile becomes poisoned, stunned, cursed or webbed, immedediately add 1 cheese to Tilda's stash. - Major Heal - 2 - Action. Remove 1 wound from 2 mice, or 2 from 1 on same space or adj. Don't party stash items get cleared between chapters? +1 cheese to the wheel. Tilda misses and winds up next to the fireplace. The blacksmith saunters up to the pair of archers before jogging one's memory far too hard. Summary: One of the ERW's in the space with two is eliminated; one more cheese goes onto the wheel. Attempting to press the advantage that Tilda has created, Maginos joins her, flourishing his staff. Unfortunately, the old mouse gets too preoccupied with looking impressive and fails to land a solid blow. Summary: 2 cheese for Maginos, who ends in the same space as Tilda. Sorry folks, a little crazy..and as much as I'm looking forward to Filch, I can't pull off the usual flavor. 1 dead rat, 2 cheese for Filch, 1 for the wheel, and it's the Rat's turn. Filch will charge the rat by the fireplace. No cheese on the wheel. The rat put one there but filch took it off for defeating a rat. Right..I get my cheese from the wheel with rats. Thanks.
) [+] easily blocks them.
) [+] but cannot find the courage to draw back the bowstring with the hulking Nez standing so close to him. +2 cheese to the wheel. I am going to attempt to move and hit the rat who's not fighting anyone. "Come on you stupid rat" Tilda mutters. Nez swings his hammer and takes out the elite rat warrior in the space next to him and then retreats to the space with the rest of the mice. Maginos surveys the landscape, noting a large grape that he thinks might be useful. Summary: 1 cheese for the wheel, nothing for the mice. Rat is up. his dagger into the last rat. The arrow flies harmlessly past Filch but two cheese are added to the wheel. The first triggers a surge and two angry rat warriors enter the forge.